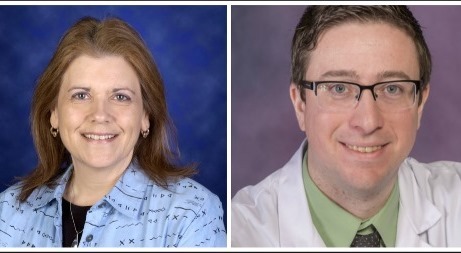 Pictured from left: Juliann Binienda, Ph.D., and Christopher Giuliano, PharmD, M.P.H. Wayne State University faculty members from the School of Medicine and Eugene Applebaum College of Pharmacy and Health Sciences will use $50,000 in funding from the Patient-Centered Outcomes Research Institute in Washington, D.C., to collaboratively tackle reducing health disparities in African-American patients with atrial fibrillation by organizing a research partnership of health care providers and community members. Principal investigator Juliann Binienda, Ph.D., associate professor of Family Medicine and Public Health Sciences, and project co-leader Christopher Giuliano, PharmD, M.P.H., associate professor of Pharmacy Practice, will use the support from PCORI's Pipeline to Proposal Awards program to build "Can't Stop the Beat," a proposed partnership of individuals and groups. "We want to create a group of stakeholders - health care providers, community members, insurance companies - who have an interest in improving the prescribing anticoagulant medication to prevent stroke and improve the medication adherence rates for African-American patients who are prescribed these medications," Dr. Binienda said. "Our goal is for this group of stakeholders to create comparative effectiveness research questions, seek continued funding and progress the project forward to meet our aims." They are already working with some community partners and stakeholders within Wayne State University and the city of Detroit, but welcome additional participants. Interested individuals or organizations should email Dr. Binienda at jbinien@med.wayne.edu or Dr. Giuliano at ek2397@wayne.edu for more information. PCORI Pipeline to Proposal Awards enable individuals and groups not typically involved in clinical research to establish the means to develop community-led funding proposals focused on patient-centered comparative effectiveness research. "The Pipeline to Proposal Awards program is a manifestation of PCORI's commitment to the meaningful involvement of patients, caregivers, clinicians and other stakeholders in all our research endeavors," said PCORI Chief Engagement and Dissemination Officer Jean Slutsky, P.A., M.P.H. "It provides support to those who may not otherwise have an opportunity to contribute to the field of comparative effectiveness research. We're pleased to follow the awardees' progress as they develop partnerships and begin to form research questions." PCORI is an independent, nonprofit organization authorized by Congress in 2010 to fund comparative effectiveness research that will provide patients, caregivers and clinicians with the evidence needed to make better-informed health and health care decisions.